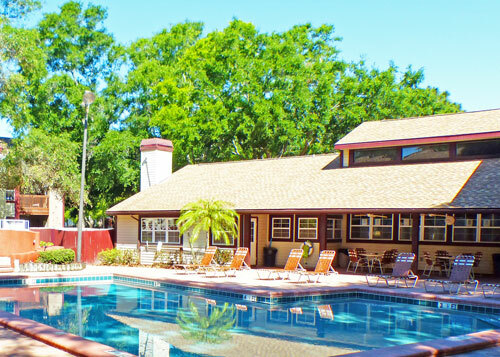 Located in Palm Harbor, Pinellas County on Florida’s beautiful west coast, Harbourtowne at Countrywoods is a 248 unit Condominium Community that offers the majority of its privately owned units for rent on an annual basis. The 1, 2, and 3 bedroom units offer unique amenities such as a private fireplace, and full size washer/dryer in each unit. The desirable location of Harbourtowne allows its residents to choose from multiple recreation, dining and entertainment options all within minutes of home. Picture this: view an incomparable Gulf of Mexico sunset. Launch a kayak from Palm Harbor’s Pop Stansell Park for private viewing of Florida’s diverse wild life. Hop on the 38-mile Fred Marquis Pinellas trail for cycling, walking, hiking, jogging, and inline skating. Just 5-miles away will bring you to the entrance of Honeymoon Island State Park or you can opt to hop on the Caledesi Island State Park Ferry to spend the day on what was rated “America’s Best Beach” in 2008. Caladesi is one of the few remaining “undisturbed” barrier islands in the state. If you choose to spend the day closer to home in your pet friendly community, your recreation choices include a tennis court, fitness center, racquetball court, swimming pool, Jacuzzi hot tub, and community grills with dining areas. The amply sized clubhouse offers residents another option for entertaining larger groups of family and friends with Pool Table, kitchen facilities, bar area, large screen television, dining/living area and fireplace. Stop by for a visit…we would love to show you why we call this “HOME”.